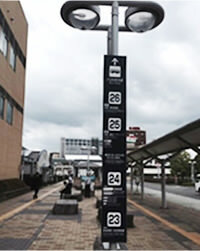 Travel from Toyama Airport to Toyama Station takes just 25 minutes by local bus. Tateyama Sta is 1 hr from Dentetsu Toyama Station on the Toyama Chiho Railroad. Dentetsu Toyama Station and JR Toyama Station are in separate buildings and there is a 5 minute walk between them. See also How to Buy a Ticket. To ride the local bus to Ogizawa from Shinano Omachi Sta, use the bus stop to the left of the station exit. 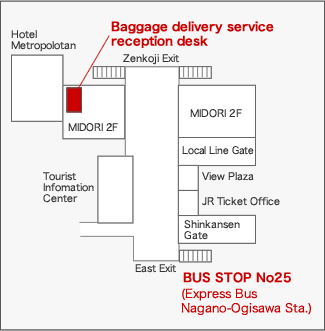 Tickets for buses to Ogizawa Station can be bought at the bus ticket sales counter. * Tickets for the Alpine Route can be bought at the Ogizawa Station. From the boarding point, it takes 40 minutes to reach Ogizawa Station (terminal station), which is the entry point to the Alpine Route. Pamphlets in multi-languages are available at Tourist Information Center (inside the station) and Accommodation Guide (Omachi City Association of Ryokans). Baggage delivery service is available at the Alps Roman-kan.
See also Map of Stations. Please purchase tickets on the bus. Have change ready. The baggage delivery service might take some time. The baggage delivery service desk is about 5-10 minutes away from the bus stop.